Training is more popular than it’s ever been in the sport of climbing, and it warms my heart to see people actually training in the gym rather than just hitting another bouldering session. The word is out that a focused attention to improvement really works. At the crags, though, it’s another matter: many climbers serious about their training fall flat when they hit fresh air. Why? For most climbers, it’s a matter of planning. Sure, days at the crag are meant to be fun, but it doesn’t take long before fun means climbing well on hard routes instead of waiting in the toprope queue. At first, getting on a “project” occasionally works, and most of us race up to somewhere in the 5.12 range with regular visits to the crag. Eventually, even this tactic runs dry, and a seasonal pattern emerges: the climber has 2 or 3 good periods of climbing in a year, separated by long spells of submaximal performance. At this point, structured training more-or-less becomes a fact of life for the climber. With training comes greater strength, more stamina, and a confidence that might even buy them an additional grade or two at the crag. The sad reality is that this is where progress ends. I contend that it’s not poor training nor genetic limits, but bad crag planning that stops most climbers from reaching the upper grades. Getting organized so that you maximize your cragging can take many forms, but the tried-and-true redpoint pyramid is a good place to start. A useful tool to keep you on track, the redpoint pyramid is a simple chart aimed at helping you to progress as the season goes on. Although there are several strategies for building a pyramid, the most common is a 5-4-3-2-1. In this pyramid, you would aim at reaching a single maximum-level redpoint. Assuming that this is a 5.13a, your second tier would involve redpointing two 5.12d routes. The third would involve three 5.12c routes, followed by four 12b, and finally five 11d or 12a redpoints (the bottom tier almost always encompasses a couple of grades, as you’ll be moving quickly through these and it’s sometimes hard to find five routes of the same grade at a given crag). The bottom tiers of the pyramid are close to most climbers onsight level, and normally progress quickly. The pyramid is useful for a few reasons. First, it makes you build endurance through volume, which probably results in a reduced chance of injury. It also builds a redpoint mentality, which is especially useful to those new to leading, or that tend to gravitate toward the toprope. Most importantly, it forces a climber to spend time on routes that are just one click below their limit. This magical second tier is a great way to fast track actually being better at climbing rather than just grabbing a high grade now and then. The 13a climber above will reap much more from the 12d routes in his pyramid than the single 13a at the top. These routes are hard enough to make him really work for it, but are easy enough that they will go down more quickly. If you have a big trip coming up or are in an extended off-season phase, the long-cycle pyramid is a good choice. This structure features more routes at the base levels than the traditional pyramid noted above. A good choice for those needing more endurance or for those wanting to onsight better, this is normally a four or five tier pyramid, built on a 12-8-4-2-1 structure. If you are using it as a ramp up, your max grade should be placed at the top (13a in the example above), if it is an off-season volume build, you might back off one grade, which makes the whole thing go by pretty quickly. In such a plan, you would aim for one route at 12d, two at 12c, four at 12b, eight at 12a, and 12 at 11d. For most climbers, several of the routes in the first two tiers would be done first go. In-season, you want to climb well. The last thing I could ever talk you into is backing off to a low pyramid base right when you’re hitting your stride. I will say, however, that every peak has a back-side…and the first step off is down. Once you’ve built up through a traditional pyramid, say early in the spring, you are probably going to get some hard sends in. Sweet. After a couple of weeks, though, the joints start to ache, the “snap” goes out of your arms, and a smart climber knows to stop before things start popping. So, looking at your previous 5-4-3-2-1 pyramid, we’ll add on a smaller, steeper-sided pyramid to keep things rolling. My favorite in-season pyramid is a 2-2-1-1-1, which starts at the fourth-tier level of your original pyramid. With this style of program, one gets a slight respite from hard sending, and by doing two routes at each of these lower tiers, we force a few days of re-ramping. If you just got done sending 13a, dropping back to a few days of 12b and 12c climbing will feel like a well-earned vacation. Most importantly, your volume will tick back up, and get you out of the project-only descent into poor fitness. I am also a big fan of the 2-2-1-0-1 pyramid, especially for climbers that have had a good pre-season. In this pyramid, you’d skip over redpointing a second limit-level route (13a in our previous example), and instead move on to a new max grade. Although it looks great on paper, it is not a good plan if your preparation doesn’t match your ambition. Don’t let the climber you wish you were overpower the climber you really are. When we travel, onsighting is the name of the game. As much as we’d like to climb at our max grade on the road, unless it is a very long trip or we travel a lot, we often top out a couple grades lower than we do at home. A well-designed onsight pyramid starts one to two grades below your normal onsight level, and is a wider, shorter pyramid. The name of the game is volume. For this we like to look at an 8-7-6 distribution. For our 13a redpointer above, we would probably use 11d as the base. This pyramid should not be treated the same as a redpoint pyramid as far as progression goes – you should be willing to climb any and all grades within the pyramid at any time, and use the pyramid simply as a guide for distribution of your grades. It’s no secret that we slowly get out of shape when we are in full-on project mode. The send is important – we tend to warm-up specifically for our route and climb with greater and greater efficiency with the single focus of sending this one climb. We don’t do extra volume, and we make sure and come into each climbing day well-rested. Most of the time, the send comes and we restart the cycle. Years ago, my friend Scott Milton suggested a different approach, which involved a project and a sub-project. Scott found that when he was over-focused on one project he got out of shape, but also felt at-risk for injury. Motivation was also a factor. 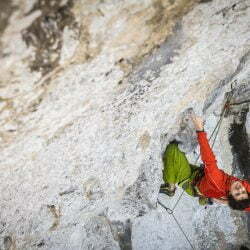 “Every other climbing day, or every third day, work another project, maybe slightly easier than your main one,” he said. 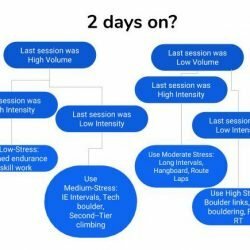 This works especially well if your main project is fitness-oriented, as the sub-project day lets you work different moves and usually forces a little more effort out of you – you don’t get tuned into climbing just one type/duration/angle of route. Your sub-project should be very different than your main project, ideally on a different crag, angle, and even rock type. 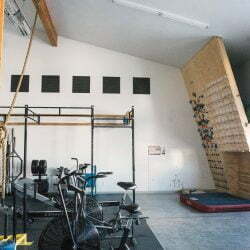 Getting organized in the gym is easy, getting organized at the crag is critical.